In our latest #TrueChallenger’s blog piece, we take a look at accomplished swimmer Lisa Williams. Lisa would probably describe herself as an average person who is trying to manage a healthy work/life balance except that her list of achievements begs to differ. Lisa is an accomplished long distance swimmer, completing a variety of swims all over Europe including both a 4 and 6 person relay of the English Channel. This time around she’s doing it solo. The English Channel crossing has been described as the ‘Everest’ of swims and attracts the best swimmers from around the world. This distance in a straight line from England to France is 21 miles, although most swimmers take a zig-zag path of around 25 miles. Since 1875, there have been 1308 successful solo swims of the English Channel and it has a success rate of less than 50% every year. Lisa will have to battle changing tides, dodge shipping vessels, swim through hordes of jellyfish and even swim in the pitch black of night. Undeterred, Lisa has accepted this amazing challenge and is due set off between the 5th-11th September (although this may change due to weather conditions). Upon completion, she will become one of the elite few to conquer the Channel crossing and become part of a very special group of 500 ladies to accomplish this incredible feat. We got the chance to chat with Lisa about her upcoming challenge, here’s what she had to say. 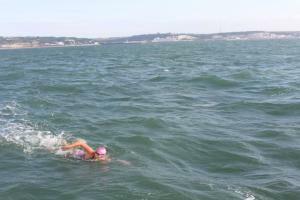 Can you tell us a little about yourself Lisa and why you have chosen to swim the channel? I grew up in the UAE learning to swim in lovely warm waters and loved the outdoors however, by the time I moved to London I hadn’t swam for about 12 years. After too many late nights going out and looking for ways to make new friends in London I found a local masters swimming club and started getting back into swimming – although it was doing sprints of 50m & 100m at Masters meets. I started wanting to do longer distances so started open water swimming and eventually was doing 3-10km swims in a wetsuit. I saw an advert for a charity relay of the English Channel and thought why not. Channel swimming rules state that you are not allowed to wear a wetsuit so I knew the cold water would be something I would have to learn to deal with. I have always tried to give myself a challenge whether it be Kilimanjaro, Tough Mudder, etc and thought this might be worth a try. So in November 2012, I had signed up for a 6-man relay of the Channel, which would head off in August 2013. In June 2013 before the relay a great friend of mine died of breast cancer and before I had even done the relay I found myself contacting the Channel pilots and booking to do a solo in September 2015. The rest is history! Is this your first big challenge? It will be the biggest challenge I have ever done but I have already done a 6 man one way relay and then as part of training for my solo I have also done a 4 man two way relay (England – France – England), a two way swim of Lake Windermere (21 miles in 12 hours 23 minutes), a two person relay of Lake Zurich (26km) but I have done a few non swimming challenges such as Kilimanjaro, tough mudders etc over the years. What has been the biggest challenge in your training and what have you done to manage it? I guess you will always have time challenges – trying to fit in work, training and social life but for me, my biggest challenge is believing in myself and my ability. Confidence has always been a problem for me but in long swims there isn’t much else to do so I find myself telling myself I can do it and shouting at myself to get on with it. I guess I see myself as an ordinary person trying to achieve some extraordinary things and to me the Channel is one of those things. I find that you are always stronger than you think you are and it is amazing what the body can achieve when you put your mind to it. Where do you draw your inspiration from for this challenge? Generally I draw it from within and not wanting to fail, I want to be able to use the challenges I have done to inspire others to do something special with their life. If I succeed it will allow me to have a powerful message to be able to do that, I will be one of fewer than 500 women in the world to have done it. However, the Marathon swimming community is full of extraordinary people who are so giving with their time and advice it really is a great group to be part of and one where you can not fail to be inspired but the things that they all do. Are you completing this challenge for a specific charity? In June 2013 a wonderful friend of mine died of breast cancer after 7 years of battling with it. At her funeral I decided that I was going to swim the Channel in her memory – it was a moment of madness and over two years later it is almost a reality. The Royal Marsden looked after her so well over that time and she always praised them and the doctors that worked with her so the swim has a real personal reason to succeed – something that will also hugely inspire me as I swim. If you could do any challenge in the world, what would it be? I would love to climb Everest one day, I used to spend lots of time walking & in a previous job was lucky enough to take a group of school kids on an expedition to Mexico, work in an orphanage and climbing some of Mexico’s volcano’s and mountains. I love watching people develop as they work together in teams and would love to get to the top of the world with a team of people, all working together to achieve the same goal. What’s the best piece of advice that you have been given about this challenge? Swim from feed to feed and never look back to England or forward to France! 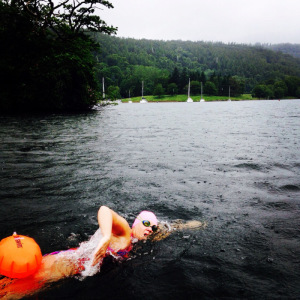 Most people who have swam the Channel say they break it up to just swim to each 30/45 minute feed rather than having to think about swimming the whole 21 miles so that is what I will be doing and what I did for my 2 way Windermere swim. What are you most nervous about in your challenge? Swimming in the night. As my swim is in September and the nights are longer I will be swimming at night, some swims set off and the swimmer swims their whole swim through the night – for many night swimming is peaceful and enjoyable. For me it is something that I dread. I have done it on both my relays but it didn’t help me like it any more. But if I want to get to France I have to do it and so I will but I don’t look forward to it. Captain Matthew Webb said ‘Nothing Great is Easy’ and so I can’t expect to enjoy every minute of it. Also I don’t like jellyfish but apparently they only feel like nettle stings so I can deal with that. Once you complete this one, have you already got your eye on your next challenge? Lisa’s push to inspire others to take on a challenge of their own is commending. She is proof that you can live a ‘normal’ life and still achieve extraordinary heights. You can read much more about Lisa’s challenge on her personal blog site. You can also find her on Facebook and Twitter for her most recent updates. Let’s show some support for Lisa and her amazing challenge and please donate to her fantastic cause on her JustGiving page. We all look forward to hearing about it in September! Are you inspired by Lisa’s story? Has it brought about a desire for a big challenge? Let us know what your next challenge will be on our Facebook or Twitter page!